Our original design! 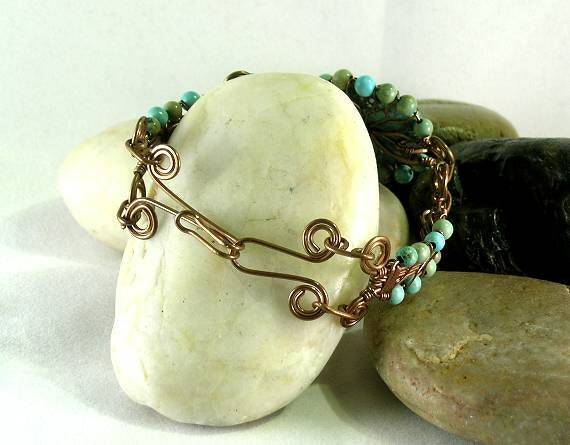 A copper bracelet made up of 3 curved links. 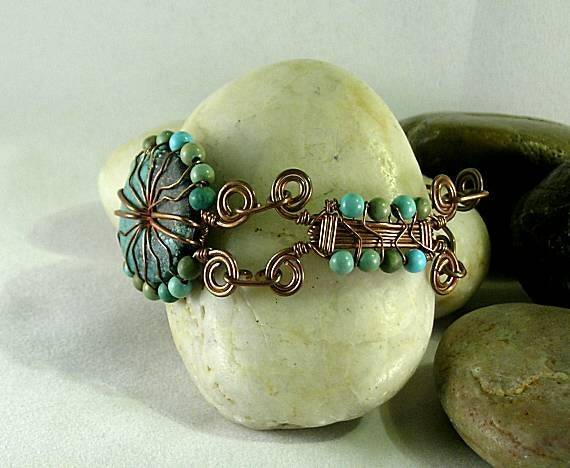 The center link is a wire-wrapped turquoise donut surrounded with 4mm turquoise beads measuring approx. 1 1/4" in diameter. 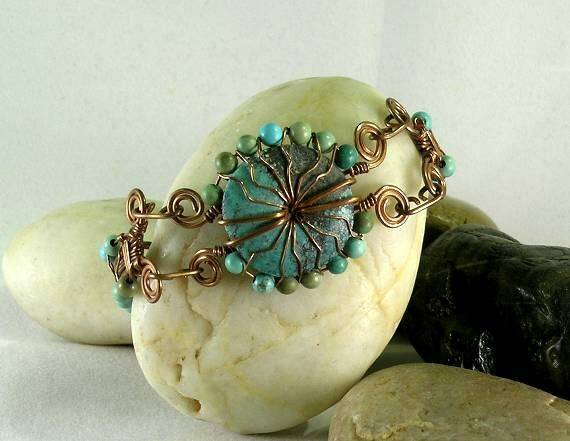 On each side it is linked wire-wrapped strip bordered with turquoise beads which measures approx. 1/2" in height. Sacred spirals connect all the links. 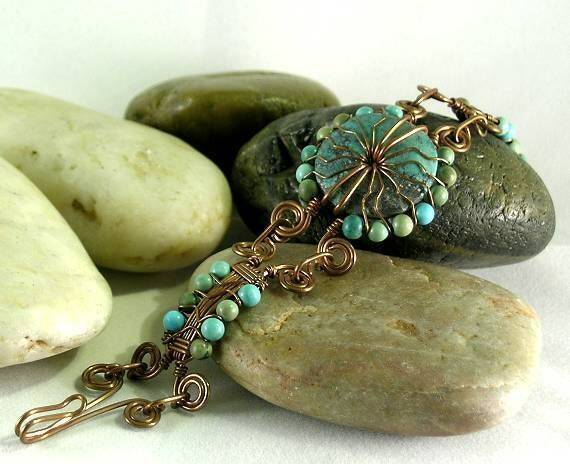 The bracelet fastens with a hook and eye closure that has the same spirals as the rest of the bracelet. It measures approx. 6 1/2" in length. We ship USPS Priority Mail with Insurance for safety and so that you will receive your purchase in 2-3 days once the package is posted. PLUS you can track its progress on-line! SACRED SPIRAL - This is the oldest symbol known to be used in spiritual practices. It reflects the universal pattern of growth and evolution. It helps consciousness accept the turnings and changes of life as it evolves. This acceptance is one of the greatest freedoms a human can experience, putting consciousness in the present moment where the power of creation lives. 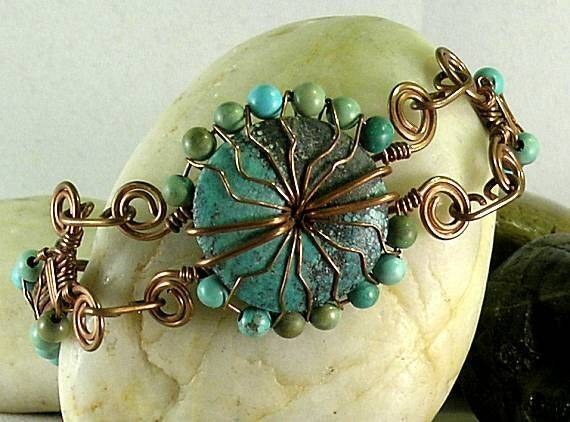 Turquoise was called the "skystone" in Native American cultures where it was believed the blue ones represented Father Sky and the green ones represented Mother Earth. TURQUOISE allows us to embrace the totality of who we are and what we have learned on our Earthwalk. All experience has value. Grandfather Turquoise teaches self forgiveness and self acceptance and the ability to release useless regrets. Honor oneself as a creation and tool of the Divine. It physically oxygenates the blood and increases the amount of life force (prana or chi) in the physical body. Cleaning Copper: This is uncoated copper so it will tarnish! Many people like the antiqued look and others want their copper to stay bright. To remove the oxidation simply put vinegar or lemon juice on it and allow to set a couple of minutes while the acid restores the shine. Rinse in water and then dry. Buff with a polishing cloth and it looks like a new lucky copper penny! History Notes: In ancient Mesopotamia, it was attributed to the Queen of Heaven as well as the goddesses associated with the planet Venus: Ishtar, Astarte and Inanna (their Sumerian predecessor). In Roman times, this included Aphrodite, the goddess of love and beauty. Also it was sacred to the Sun in Babylon as well as the Pacific Northwest (US). Its association with past solar attributes makes it a lucky metal to be used with good fortune gemstones. **Please note that all metaphysical or healing properties listed are collected from various sources. This information is offered as a service and not meant to treat medical conditions. Jagwire Jewelry Studio/Palace Gallery does not guarantee the validity of any of these statements.